With the holidays over and valentines day on the way, 2012 brings with it a wave of happy couples who just recently became engaged. This new stage in life is exciting and full of anticipation with the thought of finally exchanging vows under the alter. The hard part however, is the journey getting there. Now that you are engaged you only have months left before the big day and a lot of planning lies ahead. From booking the venue and deciding the weddings menu to picking out the right flowers and photographer, there’s a lot to be done! At Bartlett Hills we know it can be overwhelming as every year we see our Brides full of nerves and asking for vendor referrals. Well you’re in luck! 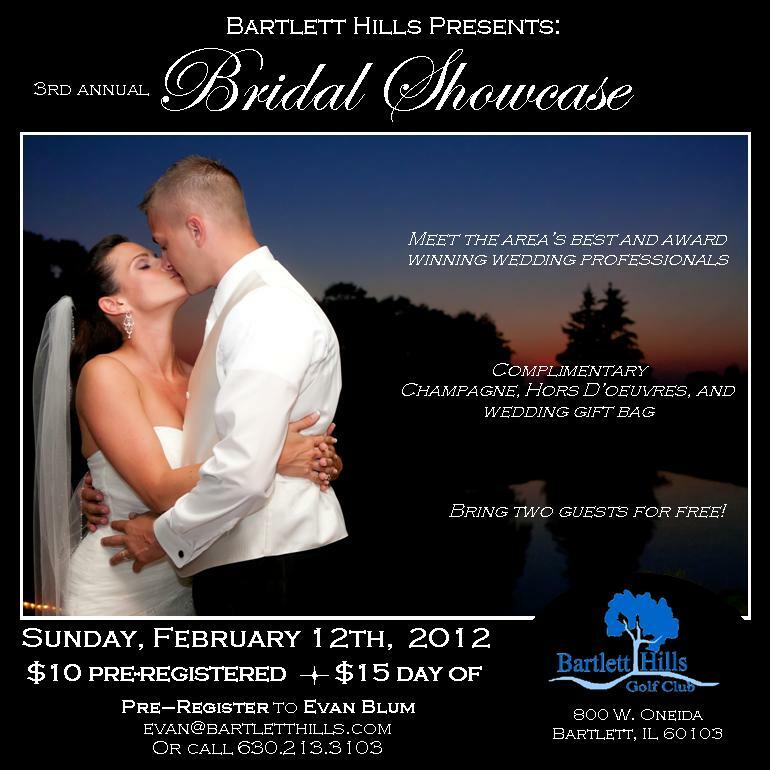 Bartlett Hills is hosting its 3rd annual Bridal Showcase set for Sunday, February 12th from 12-3pm. We will have a large variety of the area’s best and award winning wedding professionals on hand ready to give you all the advice and services you will need for you wedding. Our intimate show allows you to interact with the wedding vendors who are truly passionate and dedicated at what they do, and will give you all the information you seek to make for a perfect wedding. Many will also offer fantastic discounts and deals if you simply give them a chance to talk to you! You never know who you might find to be the perfect wedding professional for your wedding and getting the valuable one-on-one face time with them is priceless. Our Bridal Showcase will also offer champagne punch and hors D’oeurves for all the brides who attend and the first 80 Brides who pre-register will recieve a complimentary gift bag from Bartlett Hills and our participating wedding professionals! Every ticket purchased also includes 2 Free Guests!! Bring your maid of honor, fiancee, or even the parents to give you some support when you are shopping for those potential vendors. You can pre-register by calling 630.213.3103 or email evan@bartletthills.com. Our Showcase will also feature Fashion Shows by Bella’s Bridal Boutique and Formal Wear and a dance performance by Fred Astaire Dance Studio.